If you have noticed iOS 7 app icons, they are not normal squares with rounded corners. 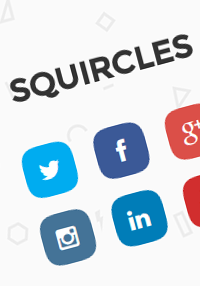 They are squircles which have properties of both a circle and a square. This demo is an attempt to achieve a similar effect using CSS3. Pseudo elements are used to create 2 fish eye shapes which are later clipped to make the sides of the suqare a bit curved. Use background: inherit to get rid of repeating when setting color. Would it be possible to display a picture (e.g. user-avatar) instead of the basic background colors? expect much more good works!! Is there any way for me to get icons for other websites too like Blogger for example? What is it supposted to do? From border-radius it all looks the same, no changes.